1 : 19495 Letts, Son & Co. 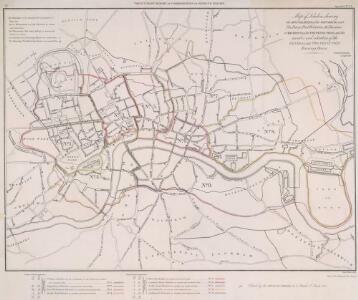 Description: This outline map of London was commissioned by the House of Commons for the21st Report of the Commissioners of Revenue Inquiry in 1830. The map's title features at top right, with the boundaries of the nine postal districts and those of the General-, Two- and Three-Penny Post deliveries outlined in colour. Boundaries are explained at top left with a key to colour usage in panel below the plan.